Please feel free to use the links on this page but please bear in mind that although I have been to the sites and they appear to be genuine I cannot guarantee the accuracy of their content. If you find a link that doesn't work please use the Contact Us form under the 'Home' link on the left. It is hoped to get WR963 back into the air. Please look at the link above (at the beginning of the text). There's a link for WR963 on the website. Have you seen or read 'War Horse' or other films about the role of animals in war? We all know about the dogs used in Afghanistan and Iraq, sniffing out drugs and explosives. They have been known to be very heroic in their actions to protect their handlers and other troops they are operating with. During the 'Great War' of 1914-1918 millions of animals, horses, camels, donkeys, dogs, even pigeons, were lost in the service of our cause. Now there is an association that cares about such animals, along the way they also give a forum for people who have lost their beloved pets, whatever sort of animal they may be. Association lapel pins, Himalayan Blue Poppy wreaths and other items, are available to enable you to support their cause. The Battle of Mirbat and Pete Winners book 'Soldier I'. South of Masirah, on the mainland, is the small town of Mirbat. Not far from Salalah it was the key to the route to Muscat for the Adu rebels trying to take over Oman in the 60's and 70's. In 1972 there was a battle fought by nine SAS Regiment personnel against approxitely 400 Adu. Mirbat is also featured in the excellent book by Pete Winner (Pete Warne in the Daily Mail story). It was Pete's first major conflict as part of the SAS and he went on to other famous conflicts such as the storming of the Iranian Embassy, Falklands, Northern Ireland. History: Opened 1 October 1947 and disbands on 15 September 1967, although it remained on Care & Maintenance until 1 July 1978 when it finally closed. The RAF Heraldry Trust, a charity formed a number of years ago with a ‘mission’ to create accurate artwork of the 1,300+ official awarded RAF badges – before the 100th Anniversary in 2018. This link is to promote the work of the Trust and they would be most appreciative if anyone seeing this could spread the informaiton about the trust. If you would like more information please click on the 'Contact' link after entering the site. The Malta Aviation Society is a non-governmental organisation and non-profit-making body and presently has over 150 members. Founded in 1971, when a small fraternity of Maltese who took up aviation as a hobby got together one afternoon and decided to set up what was then known the "Malta Aircraft Enthusiasts" (MAE). This proved to be the first step in the society's long and chequered history.The aim of the Society is to foster interest in aviation matters in general, with a particular focus on aircraft spotting, aviation photography and related matters. This is reflected by a wide range of interests by its members in diverse subject such aircraft history, restoration, aeronautical communications, air traffic control and airline operations. The Society organises and runs the annual International Airshow which is held on the last weekend in September. The branch has regular meetings on the first Wednesday of each month. Focus is the annual November reunion with members and friends making the journey to Malta for Remembrance, Reminiscence and Revelry. Great information about location, photographs etc. Angela Weatherill has told me about a facebook page for Ex-RAF Children and thought others would be interested in using it to try to find old schoolfriends. Situated in front of the magnificent port of Marsaxlokk, the most prominent Fishing Village in Malta,Ron's Restaurant will welcome you and your loved ones in a quite and relaxed environment. You may choose to dine in our seafront open air terraces and enjoy the beautiful view of Marsaxlokk. Our family run restaurant offers a wide selection of fish dishes and meat dishes. We welcome you seven days a week including lunches. Visit the Website for information, menus and contact details. This is a YouTube slide presentation of the history of Malta in 10.5 minutes. Very interesting and I certainly learned a lot. The Squadron was disbanded on 31st December 1977. On 01 April 1999 the RAF Sea King Operational Conversion Unit (SKOCU) was given Squadron status and became No. 203 (Reserve) Squadron. It continues to this day training aircrew for Search and Rescue duties flying Sea King Mks 3 and 3a aircraft. (With thanks to the Mod.UK site for the information). Click Here for the site which includes the long history, and list of aircraft flown by the squadron. 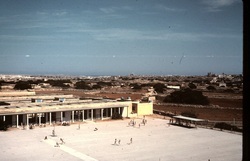 The Squadron began a long association with Canberras and moved to Malta in 1965. As the RAF withdrew from its Middle East bases in the late 1960s, No. 13 remained in Malta until transferring to Wyton in 1978, continuing to fly Canberras until disbanded in 1982. No. 13 squadron reformed with the new Tornado GR1A at Honington on 1 January 1990, and moved to its current home, Marham, some four years later. Click Here for the Mod.UK site with all the history of the Squadron. The Jet Age Museum is based in Gloucester with a new permanent home for its collection of aircraft mapping the historic connection between aircraft manufacturing and the county of Gloucestershire. Take a look at the museum website for information about the collection, opening times and news about the museum. If you wish to become a supporting member of the museum an application form is available on the website. Help keep this icon of British design alive, even if she isn't flying, to inspire the young of today into Science & Engineering, and to tell them about the history of the V Bomber era. Avro Vulcan XM655 was third from last of the Vulcan bombers produced for the Royal Air Force, being delivered in late 1964, and was part of the UK's nuclear deterrent force throughout the 1960s and 1970s. It is now owned by Wellesbourne Airfield, and is looked after by 655 Maintenance and Preservation Society (655MaPS) which is a volunteer organisation of Vulcan enthusiasts. XM655 is one of the few Vulcans remaining in ground running condition, the only one with the most powerful of the engine variants (Bristol Olympus 301s) and 655MaPS aim to keep it running for as long as possible. The aircraft systems are powered up and exercised regularly, engine ground runs are carried out several times every year, and a "Fast Taxi" event is carried out every summer to show off the aircraft and raise funds to support its preservation. So starts the homepage of the accomplished artist and painter Carmen Pizzuto, who is active on this website and the discussion forum. Take a look at her website for information, critiques, exhibitions and contact. An association dedicated to the past members of Trade Group 11, would include present as well but technology has moved on and the trade group was disbanded in favour of ICT (Information Communication Technology) trade. Annual re-unions are held and information is on the website. Many people have been reunited with old friends through the assocation. Ray Stokes has a website that would be of interest to any Boy Entrant but particularly those from 45th Entry. SEE HERE for all things maritime in the RAF. The Aviation Museum in Malta has many historic exhibits and information, well worth a couple of hours visit at least. Just one example of the excellent graphic art that Richard creates. This is Nimrod XV250 which served with 203 Squadron at RAF Luqa, Malta. Richard has an interesting website with aviation art including a very nice graphic of a 203 Sqn Nimrod and a Shackelton over Valetta. If you want to see Richards work please go to this link. This website contains a great deal of information, built up over years, about everything connected with aviation in malta. Click HERE to access the website. An essential site for anyone interested in the Aviation history of Malta. This has to be a link that would be appropriate to many people that served at RAF Luqa with the almost constant presence of PR (9 and 7) Canberra's of 39 and 13 Squadron. Website created by Hector Farrugia who lives in Luqa village and has a great interest in the period that the RAF were based at Luqa. 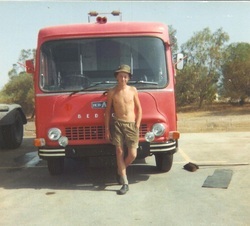 His website can be found hereLUQA FIRE SECTION, please feel free to visit and let Hector know if you have any comments. This link has interesting information about the development of aviation in Malta right up to the laying of the foundation stone of the new civil airport. Information about Malta, sign up to the monthly newsletter which gives news and events happening in Malta etc. Click here for the website and Click Here for subscription to the monthly newsletter. This is Malta's largest online ship photo gallery. MaltaShipPhotos also features an interesting collection of aircraft, vehicles and Maltese Islands photos. Most photos on this website were taken by Captain Lawrence Dalli. Tim Addis runs a website which mainly focuses on Malta during the war years. There is a page called 1950+ which contains photos of Lightnings etc. and the site continues to grow & has to be revised regularly with new categories. Tim's father served on RAF Luqa during 1940-43. Phill Rose sent a link to this site which has some great photos and memoirs from people that attended the school. For any of your modelling needs or desires you have to visit Antics model shop in Gloucester. Aircraft, Vehicles, Railways, diecast models, RC Flying Models, Tanks, Trucks and Boats. the list is huge. This is the company I used to book my trip to Malta in September 2012. My daughter has used them for the 3rd time and has always been pleased with the result. She goes to Portugal so I thought I'd see what they offered for Malta. Half the price of booking through an agency such as Thomson or Co-op Travel. Update October 2012 - Used 'On the Beach' for my week in Malta 26 Sep - 03 Oct 2012 and found them excellent for booking flights and hotel on line. Greeted at the airport by a rep who gave a package of information and couple of sightseeing vouchers. I would certainly use them again. Click Here for the RAF Seletar Association website. If you were at Seletar, or anywhere in Singapore, at anytime this will be of interest to you. Click Here for the RAF Gan Remembered website. Canberra Association - information and events for those interested in keeping the memory of the Canberra alive. "Those lucky enough to have been members of 203 'the happy squadron'. " However, it is open to all those who have an interest in this Squadron and indeed those who have an association - direct or indirect - with 203 Sqn. And for 'Doggy' people in Gloucestershire. I've also created a website for the Stonehouse Dog Training Club.